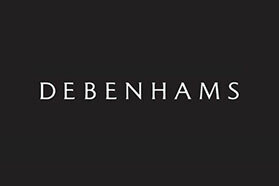 Debenhams plc is a British multinational retailer operating under a department store format in the United Kingdom and Ireland with franchise stores in other countries. It sells a range of clothing, household items and furniture and is known for its 'Designers at Debenhams' brand range. Debenhams carries children's clothing from infancy upwards, including school uniforms, as well a variety of toys and games.